Horses have sensitive digestive systems and can therefore suffer from stress, which they must overcome quickly to recover and return to work. These critical periods require specific nutritional support. Ekymash Booster’s highly comprehensive formula contains lemon balm bre, thyme and peppermint extract, along with prebiotics, electrolytes and magnesium. In horses being weaned back on to food, Ekymash Booster can be mixed into mash. Additives:Aromatic substances: apple flavouring 3060mg, apricot flavour 3030mg 2b- Aromatic substances: mint (Mentha piperita—tincture) 10 g, stevia extract CoE552 3g, thyme (Thymus vulgaris—ext.) 10 g, lemon balm (Melissa officinalis—tincture) 10 g.
Analytical constituents:Humidity 40%, crude proteins 1.7%, crude fats 0.1%, crude ash 6.5%, crude fibre 0.10%, sodium 1.3%. Complementary feed formulated to meet the digestive needs of horses. 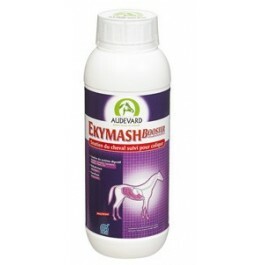 In horses being weaned back on to food, it is preferable to mix EKYMASH BOOSTER into mash. Increased requirements:100 to 250 ml per day for 2 to 5 days. Standard requirements:50 to 100 ml per day for at least one week.